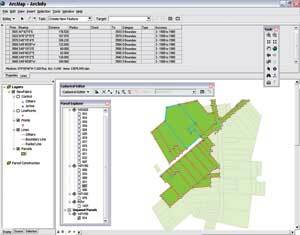 Work with parcels in a cadastral fabric to improve the accuracy of GIS data. New parcel editing tools make the latest version of ArcGIS Survey Analyst with Cadastral Editor the most comprehensive release yet. The application's new capabilities enable users to record and maintain survey data and continuous parcel layers as elements that are part of an integrated dataset and data model called the cadastral fabric. Store both a continuous parcel fabric as well as survey-based subdivision plans without loss of any information in the original survey record. Incrementally improve the accuracy of cadastral representation as each new subdivision or survey plan is entered. Using the Cadastral Editor, individual parcels and subdivisions are entered using coordinate geometry (COGO)-based plan entry. An integrated cadastral fabric is developed from all relevant survey and plan data using least-squares adjustment for the best-fit representation of the parcel layer. Track parcel history and lineage by maintaining data, such as surveyor record and legal recording dates. Tie parcel data more accurately to orthoimage. These new features and capabilities for ArcGIS Survey Analyst 9.2 are released as part of ArcGIS 9.2 Service Pack 3, which can be downloaded from the Esri Support Web site at www.esri.com/SAdownload. To learn more about ArcGIS Survey Analyst or to evaluate, visit www.esri.com/surveyanalyst. GIS and survey solution information is available at www.esri.com/surveying.